It wasn’t until I happened to take my kids to the Two Niner Diner at Petaluma Airport for lunch this weekend that I realized an anniversary had almost passed by unnoticed — fifteen years, this month, since I earned my private pilot license. Five years earlier, Andrea bought me an introductory flight lesson as a Christmas gift, knowing that I’d long dreamed of flying. As a kid growing up in Queens, I would take the bus to LaGuardia Airport to watch takeoffs and landings (in the days before the “land of the free and the home of the brave” decided it was too terrifying to allow anyone to do this and roped off all observation areas, sucking the last bits of glamor and romance out of aviation). I checked out FAA training manuals from the library and learned them. I became an expert in Microsoft Flight Simulator (which I started using in the days when it was still the subLOGIC Flight Simulator for the TRS-80). In spite of all that, it had somehow never occurred to me to actually go and do something about learning to fly. It took Andrea giving me that certificate to get me in the air. So one cold day in January 1991 I drove to Phoenix Aviation (issuer of the gift certificate) at Allegheny County airport, and a flight instructor named Jay Domenico took me aloft in N6575Q, a bright yellow Cessna 152, and handed me the controls. I was hooked, and I continued flight training at Phoenix with Jay. But between my meager finances, my job workload, and the unreliable weather around Pittsburgh, I didn’t train often enough to earn my license during the next two years, following which I moved to California to join a tiny software startup. The weather there was a lot more conducive to flying, but as often happens to those who commit themselves to tiny software startups, my available time and money dwindled to almost nothing. By 1994 that situation had improved. I celebrated a successful major software release with a resumption of my flight training, and by September of the following year I’d passed my checkride and earned my license — just as enormously satisfying an accomplishment as you can imagine. Best of all, sharing the controls on a trip to Harris Ranch with my childhood friend Chuck, who used to come with me to watch those planes at LaGuardia and who also earned a pilot license after moving abroad for college. 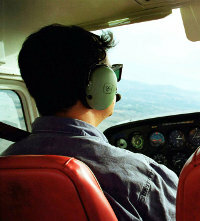 Private pilots must undergo so-called biennial flight reviews (at two-year intervals, hence “biennial”) to maintain the validity of their licenses; it’s sort of like having to take your driving test again and again if you want to keep driving (which wouldn’t be a terrible idea, if you ask me). Having earned my license in September of 1995, and having renewed my BFR promptly every other September after that, I had a BFR due in September of 2001. A few days before my appointment, some murderous idiots hijacked some jetliners and flew them into some landmarks, and all aircraft nationwide were grounded for a period of days. My BFR was canceled. When the opportunity arose to reschedule it, I didn’t — because by this point, Andrea and I were expecting our first child. I never thought of flying as an especially dangerous hobby, but it’s certainly more dangerous than not flying, and the prospect of new-parenthood was enough to ground me, at least temporarily. That spring, Jonah was born, and two years later so was his brother Archer. It had been three years since I’d flown and I was missing it terribly. Worse, I knew that my flying knowledge and skills were decaying, and that it would take several hours of refresher instruction before I felt comfortable flying again by myself. With two young kids, a new job, and a new house, that simply wasn’t in the time or money budget, but I consoled myself with this plan: I would keep my flying ability secret from my kids, and then one day, when they were old enough to be properly impressed — around 8 and 6, I figured — I’d spring it on them, taking them to the airport and surprising them with a flight over the local area, their dad at the controls. By then I would surely have worked some refresher training into the budget. Well, the kids are now 8 and 6 and there is still no flying in the foreseeable future. But they still don’t know their dad’s a pilot, and they still don’t read this blog, so the possibility still exists — though maybe not for long — that I can blow their minds someday. Once in a while I toy with a blog post for a long time before publishing it — sometimes many months, as in the case of this one. I knew that I wanted to tell the story of The Grape, tie it together with my interest in flying and in computers, and prognosticate about similar leanings in my son Jonah, but as sometimes happens, the ideas didn’t quite gel, meandering aimlessly in search of some relevant point to make. When I was about five years old, my mom brought me and my sister on a routine trip to the local supermarket. As we entered the produce aisle we found to our delight that grapes were in season again. Immediately my mom plucked a grape from a bunch on the shelf and popped it in her mouth. She gave one to my sister, who did the same. She gave one to me and I stared at it, aghast. “I can’t eat this,” I told her. “We didn’t pay for it!” My mom patiently explained that it’s OK if people take one or two grapes as they walk by. “But that’s stealing!” I protested. “If everyone did that, there’d be none left!” Other shoppers turned to see the little boy making accusatory sounds at his mom. “We’re going to buy some anyway,” my mom said, still holding out a grape to me, “so it’s OK if you have one.” No, I insisted — we had to wait until they were paid for. Losing her patience, my mom uttered through gritted teeth the punchline of one of my family’s most-retold stories about me: “Eat. The. Grape.” I flatly refused, and she pointedly fed more grapes to my sister. We went home sore at each other, and for the rest of her life, I would express dismay at her occasional willingness to commit (very) petty larceny, such as taking home a hotel towel or an interesting salt shaker from a restaurant; and she would come back with, “Eat the grape,” which became her shorthand for my irksome excess of honesty. Rules — I love ’em. I love the way simple ones gives rise to complex behavior, whether it’s a game of Go or the orderly society that emerges from (for instance) people paying for their produce before eating it. It’s no wonder I was drawn to a life of writing computer software, where rules per se achieve their purest realization. A computer program is nothing but rules, after all, and with some care and some artistry it can be made elegant and simple and still create a very rich set of behaviors. Obviously not everyone is as enamored of rules as I am. So what’s the attraction? It must have something to do with a need to impose order on a bewildering and uncertain world — bewilderment and uncertainty that comes from the irrational behavior of other people. This is a common bit of pop psychology. Being unable to fathom irrational behavior, and withdrawing from even trying, explains, for example, the popularity of Star Trek‘s Mr. Spock (who, interestingly, is a hero especially among computer programmers). My son Jonah seems to be like this. He is always keenly aware of the rules in any situation, and alert to anyone not following them, or to any other source of unfairness, and quick to call it out. Most of his friends are not so preoccupied about fairness, but he does have one or two who are paralyzed by fits of red-faced outrage whenever anything doesn’t go according to the rules. Having witnessed a couple of those fits, and thinking back over my own life, I’ve lately come to think that those who love rules are at a disadvantage to those who can abide their neglect, who can tolerate ambiguity better. Mr. Spock was only the first officer aboard the Enterprise, after all; it took the greater resiliency of James T. Kirk to be the captain. And while one of Jonah’s friends is pitching a fit, the others are still running around and having a great time, completely unfazed. We were never told why it was so all-fired important […] the only rationale available seems to be the most cynical one — it is merely doing the bidding of companies that provide substantive campaign contributions. So we citizens can believe all we like that everyone’s equal before the law, but in fact if you’ve got pockets deep enough, you can buy whatever kind of law best suits you. Very likely this has always been the reality in America (as it has throughout human history), but all past attempts to tilt the playing field in favor of the powerful and the well-connected at least pretended to be for the common good. This bill does not, and that’s what’s so jaw-droppingly wrong with it: it says that the vaunted “rule of law,” the very bedrock of the Enlightenment and the principle that has always guided America no matter how far she’s strayed from it, is now officially just a fairy tale, and only fools will henceforth strive toward that ideal. If you’re wealthy, go ahead and break whatever laws you like; your pals in Congress will patch things up later. How many generations will it take for America to recover from abandoning even the pretense of fairness? How much civil unrest? How much political violence? This is another reason people like me love rules — we can see what life would be without them. But if the rule of law is just a fantasy and always has been, then laying it bare like this might be just the thing we need. Give everyone else a chance to see what life is like without rules. In the end, I predict, though the cost may be high, everyone will love them like I do. At my previous layover in Detroit (yes, this one is a three-legged trip), there are CNN news monitors all over the terminal. The recorded security announcements about keeping your belongings with you begin with a woman’s voice stating, almost apologetically, “Due to heightened security restrictions…” And in the bookstore under “Fiction” there was a whole shelf filled with Kurt Vonnegut novels. Having finished and enjoyed Jailbird recently, I was eager to start on his masterpiece, Slaughterhouse-Five. The bookstore had many Vonnegut titles but not that one. Here in the Twin Cities, it’s not CNN that appears throughout the airport but Fox News, which operates the magazine and candy concessions. The security announcements begin with a booming man’s voice declaring importantly, “The Security Level as established by the Department of Homeland Security is Orange.” And the bookstore contains no trace of Kurt Vonnegut, a favorite nemesis of conservatives. Moblogging from the Lindbergh terminal of the airport in Minneapolis-St. Paul, unexpectedly en route to New York, where my mom’s health has taken a turn for the worse. By tonight I should be back at my dad’s house near Roosevelt Field, where Charles Lindbergh took off on his history-making flight. And the book I’m reading on this trip (Jailbird by Kurt Vonnegut) just mentioned Charles Lindbergh in passing. I just can’t get away from that guy! And once again, my connection appears to have required about the longest walk between gates that it’s possible to have at this sprawling facility. I’m not complaining — it was a nice walk, and I can certainly use the exercise. But how is it possible that that happens every time I fly? In 1995, when my primary flight training was complete, it was time for my checkride to see whether I’d become a licensed pilot or not. For the checkride I had to fly from my home airport, Petaluma, to the FAA examiner’s airport, Santa Rosa (er, the Charles M. Schulz Sonoma County Airport — yes, that Charles Schulz). That flight was uneventful. When I arrived I shut down and secured the plane as usual, then went in to talk to the examiner for a while before we began the “practical” (flying) portion of the examination. Unlike Petaluma, Santa Rosa has a control tower, which means you must radio for permission to taxi. So after preflighting the plane, climbing aboard, strapping in, putting on my headset, starting the engine, and performing the pre-taxi checklist, I radioed the tower. “Santa Rosa ground, Cessna 24498 on the main ramp, taxi to the active with Foxtrot.” The tower did not respond, which is not too unusual as control towers sometimes get busy and taxi clearances get low priority. So after a few seconds I radioed again. “Santa Rosa ground, Cessna 24498 on the main ramp, taxi to the active with Foxtrot.” Still nothing. I double-checked the frequency to which the radio was tuned, waited a few seconds and tried again. Then again. Finally after several long minutes, with the instructor waiting patiently beside me (and was that a bemused smile on his face the whole time? ), I noticed that I’d forgotten to plug the headsets into the radio stack! The instructor and I were able to talk to each other but not to the tower. About an hour later I was a licensed pilot. Moral of the story: if it takes a little longer to do things right because you haven’t thought of everything, it’s still better than the alternative. My life has always been noisy. I grew up in an apartment in Queens right under an approach route for LaGuardia Airport. Most days of the week I spend two or more hours commuting in a poorly soundproofed economy car. And of course I am almost continuously sitting at high-powered computers and the constant drone of their cooling fans. One day I decided to try to find a quiet spot. A really quiet spot, where I could hear no trucks rumbling by, no gas station air compressors, no high school football team; no crashing surf or gurgling brook; preferably not even any wind, or the rush of my own blood in my ears (as when they’re underwater or stuffed with earplugs). I didn’t want to not hear anything; I wanted to hear nothing. I wanted to listen to silence. Obviously no place in or near the Bay Area would suffice, so I located Pine Mountain Lake airport on the San Francisco sectional chart. Of all the places within easy flying distance, Pine Mountain Lake appeared to be the most remote and the most likely to be quiet (once I shut down the Cessna’s engine). My friend Steve came along for the trip. We crammed our bikes into the back of the plane just in case we had to put a little distance between us and the airport in order to find silence. But even on the mountainous roads of Pine Mountain Lake, the whoosh of cars and clatter of trucks are inescapable. If I were more intrepid and more persistent in this quest I’m sure I would eventually have found something to satisfy me — in the desert, perhaps, or out on a calm sea. But this goal languishes way, way down my priority list. I was glad to see recently that others are more dedicated to the cause, and have been more successful, to wit: One Square Inch of Silence. Ever since that evening, I’ve been playing the Two Things game. Whenever I meet someone who belongs to a different profession (i.e., a profession I haven’t played this game with), or who knows something about a subject I’m unfamiliar with, I pose the Two Things question. People love to play the Two Things game, but they rarely agree about what the Two Things are. That goes double for anyone who works with computers. Fast, cheap, good: choose two. It’s better to be down here wishing you were up there than up there wishing you were down here. The sooner you accept that your most beloved possessions will be destroyed, the happier you’ll be. If you don’t have the time for a proper walk now, you’d better have the time to clean up a smelly mess later. You can’t fool your dog.